It's been a while since Betty and I had a day out in the woods, Santa was very good to us this year via the kids with out-doorsy gifts and gift cards! 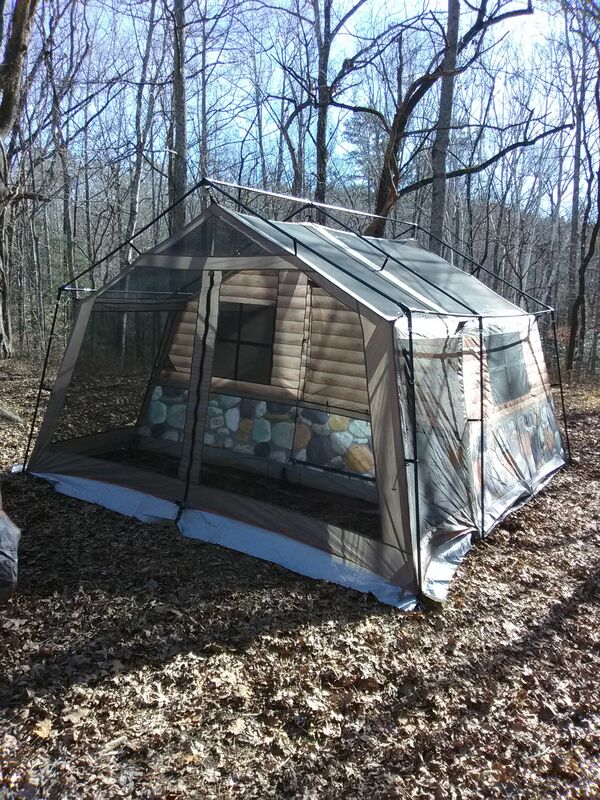 We splurged some of the gift cards and got us a tent that looks like a log cabin for our car camping adventures! 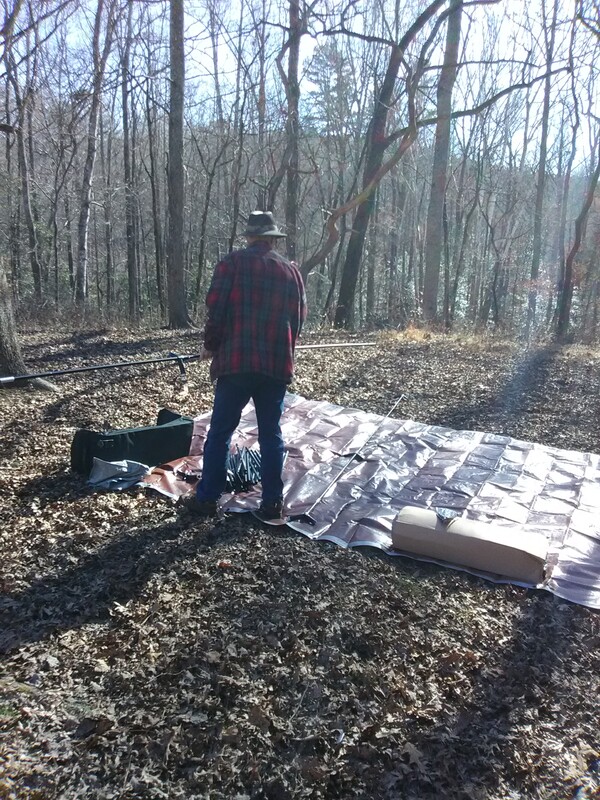 We set up at Betty's family homestead site in the WMA. Her Great-Great-Great Grandfather bought the land from the Cherokees in the late 1700's. There is a beauty of a waterfall and stream just down the hill from the homestead. 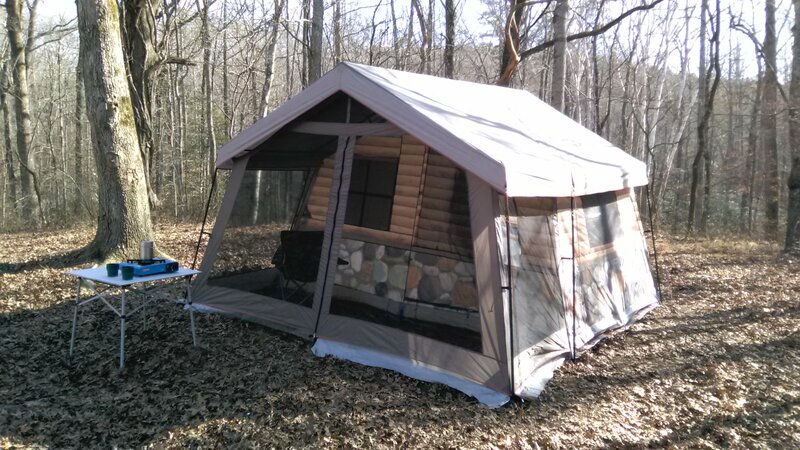 The tent is 9 x 12 in the 'living' area with an enclosed 4 x 12 'porch'. So total footprint is 13 x 12 all together. 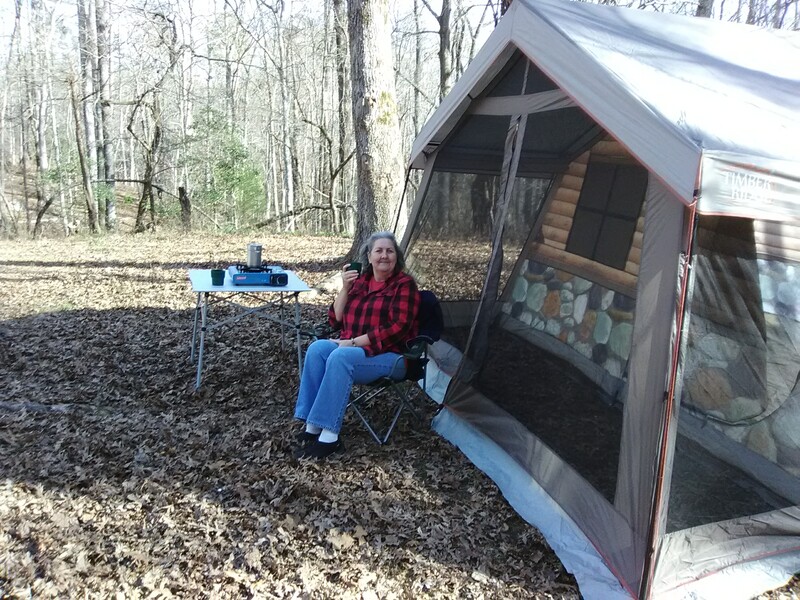 We plan on using the tent Spring, Summer and Fall....don't think we can handle winter at our age, lol. Re: Our New Log Cabin....Tent!! 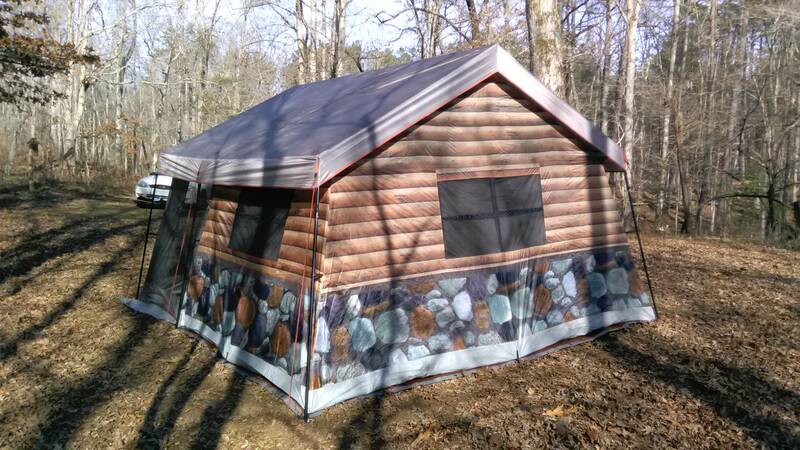 I like wall tents......and that could fool someone walking by....especially with that stone knee wall. Need a stove pipe for those chilly nights. Clever...I like that! Especially the screened in "porch". The screened in porch is also a feature we loved. There is one window on each wall, and the front door also has a mesh window in it as well, so it will be well ventilated in the hot weather here when it finally arrives. Was warmer inside with the roof on than outside thanks to the liner and all the windows 'closed'. Going to go to Lowes and get a piece of that green turf looking indoor/outdoor carpet cut to fit the porch area. The falls and Betty's Great-Great-Great-Grandfather's stone still he used to make sugar cane moonshine! They are both located just down the slope from the homestead site where we set up the tent. Neat set up Nature Boy. Beautiful waterfall and that old fire shelf is a great item from days gone by. Thanks for sharing all of this. Ripstop by the roll has a custom print outdoor ink fabric now. I've been trying to design a barn wood for my hammock tarp. I saw a pup tent that looked like a fallen shed. very camouflaged in the woods. These large tents have come down in price. I really like the porch. That's going to make summer camp a breeze. Ha see what I did there!! I recall seeing those kinds of tents for the first time in campgrounds in France and Germany back in the early 90s. I always wondered why I never saw any like them over here until just the past few years, but some Eupopean trends in camping styles seem to lag a bit before they become popular on this side of the pond. I always did think they were ultra-cool and they certainly would be more of a conversation starter in a campground than the newest cookie-cutter 5th wheel or motor home! That's awesome. Hope y'all enjoy it. Cool pics of the old still site, too! Very cool, like the porch.